After my two posts two weeks ago calling into question whether Rio Salado College has demonstrated clear student outcomes that justify its usage as an exemplar institution, college officials have responded through the WCET blog and in an article from Paul Fain at Inside Higher Ed. I recommend reading the IHE article in particular to get an understanding of the challenging an nuanced question of what is "good enough" in terms of college completion, and for even more detail read Rio's written response. Unfortunately, the lengthy explanations on graduation rates from Rio end up obscuring a critical distinction between awarding degrees versus certificates of completion. The reason this matters is that Rio appears to be doing a better than average job supporting student transfers to four-year degree programs, a worse than average job of helping students complete two-year degrees, and an unknown job of providing students with non-degree stand-alone certificates. Before dealing with this issue, I'd like to point out how useful this dialog has been and how open Rio has been in sharing internal metrics. One example that I wish other institutions used, and that can help us clarify how to understand completion data, is based on student goals. Fully 76% of Rio students have no intention to get a degree or certificate, and of this group 33% (11,628) indicated earning transferable credit as the key reason to enroll. As Sally Johnstone said in the IHE article, "It’s a feeder school for Arizona State University". This transfer of credit mission can be good or bad - it depends on how well these students perform in getting an ASU degree. In the written response, but not in WCET or IHE articles, Rio shares an interesting but incomplete metric. Additionally, as part of the work RSC does related to accountability, we track the success of our transfer students to the three public universities in Arizona (The 2010/11 – 2015/16 5 year trend shows a 77.10% increase in bachelor degrees awarded to students that had completed a minimum of 12 credit hours (up to 60 or more hours) at Rio Salado College). Increase to what and over what? It is not clear if this is comparing to Arizona university students who do not transfer any credits from Rio, or those who transfer less than 12, or those who transfer from other colleges. Nevertheless, this is an indicator of the college helping students obtain four-year degrees through credit transfers. Once you get beyond non-degree / non-certificate seeking students, the numbers are murkier, and this is the area that needs clarity. One out of four Rio students are there to get an award - how successful are they? Rio recommends we look at the Voluntary Framework for Accountability (VFA) measures, instead of IPEDS, with the following results. Notably, since 2010 Rio has defined and awarded more and more of these <1 year certificates, based on IPEDS data. We can see is that the large majority of completions, which Rio labels under graduation rate, comes from the nonstandard certificates rather than degrees. One of the strengths of VFA is that under the Six-Year Outcomes measures, you can separate out the various types of award. 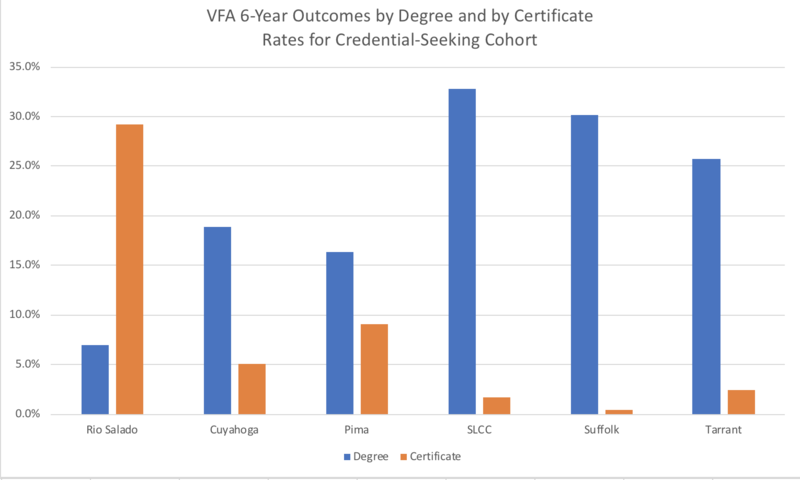 Below is the data for Rio - pay attention to the Credential-Seeking Cohort, as it removes the majority of non-degree / non-certificate seeking students at Rio only looking to transfer a small number of credits.2 Also note that VFA outcomes are mutually-exclusive and hierarchical in the order shown. If a student gets a certificate and a degree, they are listed under the degree outcome. For the Credential-Seeking Cohort, 22% of Rio students get a certificate and do not transfer to a four-year school, 7% get a certificate and transfer, 3% get an associate's degree and do not transfer, and 4% get an associate's degree and transfer. 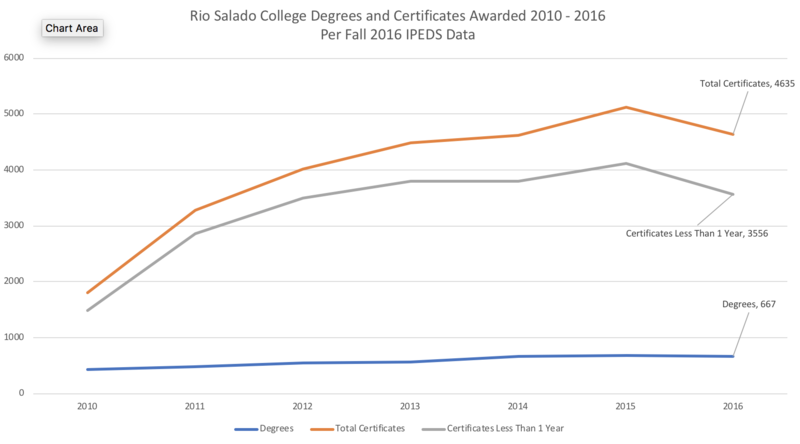 A large majority of Rio Salado completions are for certificates, which is consistent with the IPEDS data. How does Rio compare to other large community colleges? While we have not analyzed all 200+ colleges in VFA, spot checking with some peer schools indicates that Rio is well below others in awarding degrees but well above others in awarding certificates. Hill also noted that Rio Salado’s VFA completion rate for associate degree programs is a “troublesome” 7 percent. At best, this is a school with mixed results that should not simply be labeled a success without caveats or explanations. Rio has shown that they can cut costs and still be a successful transfer school, but not that they can be a successful degree school. This matters a great deal in terms of how transferrable the lessons are. It’s fine to focus on transfers when you’re right next door to ASU. But what if you’re Adirondack Community College? There are places where degree completion matter more or less than at Rio. And what about those students going to Rio who *are* seeking degrees? Does this model promote some educational outcomes at the expense of others? And if so, shouldn’t students know about that before enrolling?